Welcome to Wednesday. I’m on day 2 of a diet cleanse and exactly 2 days that I’ve had a headache. I cut out a number of things. By far the hardest are soy and caffeine. It’s a great way to find out how addicted to caffeine I am. My answer was VERY addicted. We’ll see how I do at the end of two weeks. Just hoping the headaches don’t last that long! 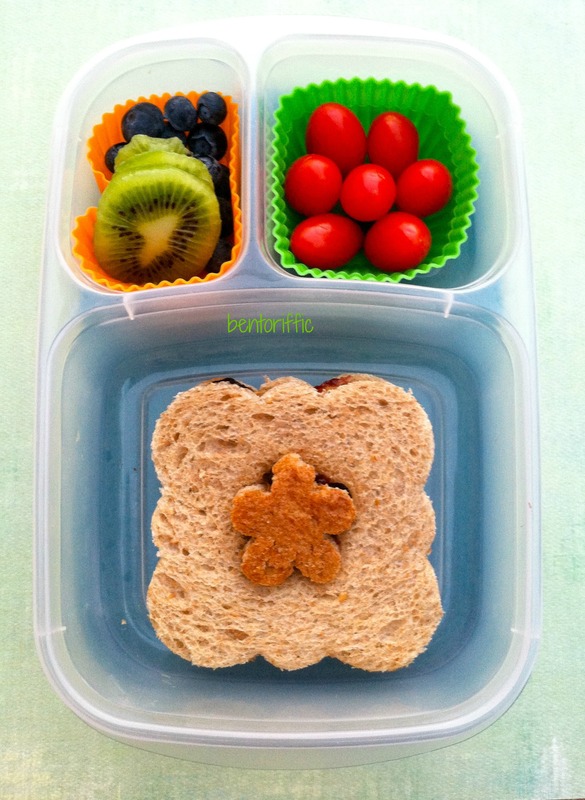 Miss G is off to school with a flowery sandwich made with a Lunch Punch Sandwich cutter on Rudi’s Whole Wheat bread. Click on the photo below to find more fun sandwich cutters. The flower in the middle is made with the heel of the bread loaf. In the top left of her Easy Lunchboxes container are kiwi and blueberries and in the top right are grape tomatoes. 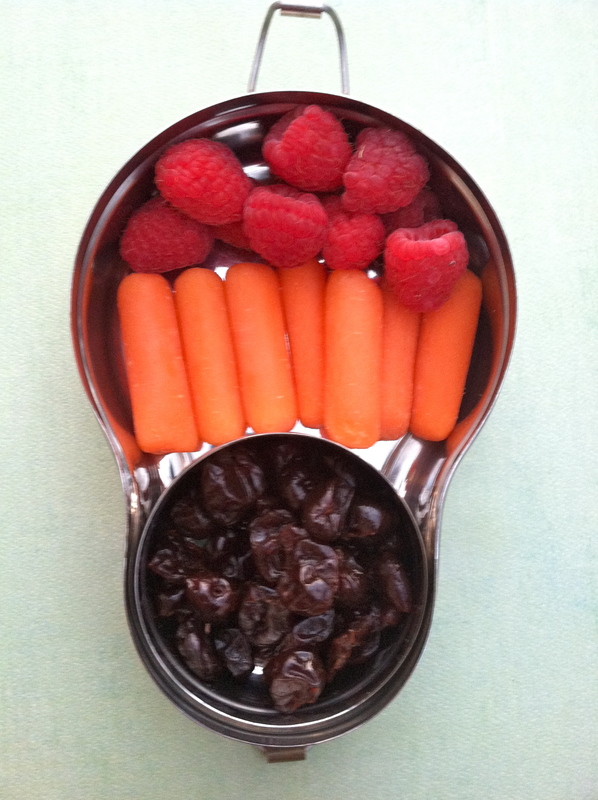 Snack time for my 4 year old is in her Happy Tiffin stainless bento with raspberries, mini carrots and dried cherries. 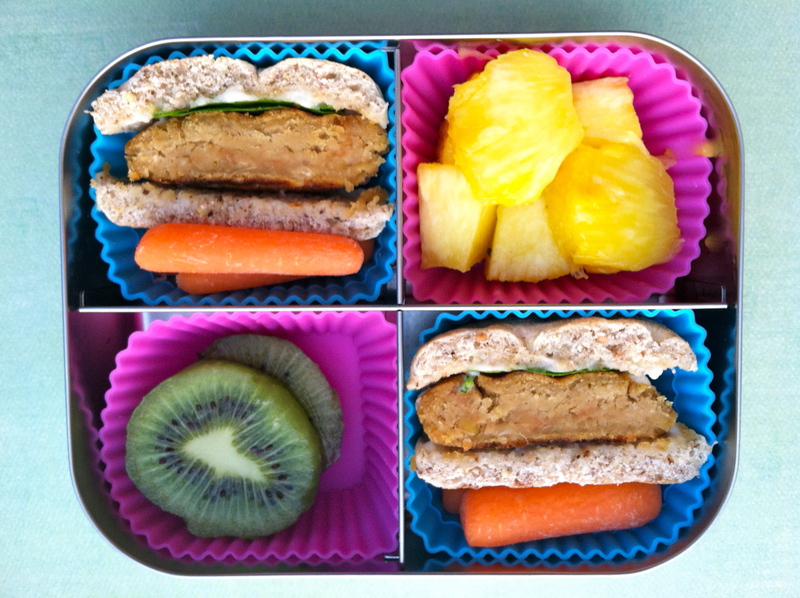 My two year old has a LunchBots Quad with mini chickpea burger halves in the top left and bottom right compartments with mini carrots and at the opposite corners are kiwi slices and pineapple chunks. 7 Responses to "Flowery sandwich and mini chickpea burgers"
Miss Z convinced me to get the Breville- expensive but worth using my store points for – built like a tank, programmable for 6 different types of tea + custom settings and more – have to say it makes a huge difference in the brew, don’t know what I did before it and now can’t live without it! Awesome! Good to know. Thanks for the info! Hi, I just started reading your blog after making the switch from vegetarian to vegan and you are great source of inspiration! And if you love the taste of coffee you might want to consider Teeccino. I’ve been caffeine free for a couple years now but when I’m really craving coffee I make a pot of Teeccino. It’s better than most coffees I’ve had and I used to be a barista in NY! I don’t work for them or anything, I just really like how it tastes:) And I know those first few weeks can be rough. Anyhoo, thanks for the great bento inspiration! I have a box of Teeccino I haven’t used yet. I have heard good things. Thanks for the compliment! If I can help in any way, I’d be glad to. We’ve only been vegan for a year so I’ve had to do a TON of searching for recipes. Thanks for reading, Lidia!